In early 1942 Boeing initiated a design study to examine the feasibility of producing a transport version of its B-29 Superfortress. The company's proposal was submitted to the USAAF for consideration and, because at that time the long-range transport was a much-needed type of aircraft, a contract for three prototypes was awarded on 23 January 1943. Identified by the company as the Boeing Model 367, and designated XC-97 by the US Army Air Force, the first made its maiden flight on 15 November 1944. The XC-97 had the entire wing and engine layout of the B-29. 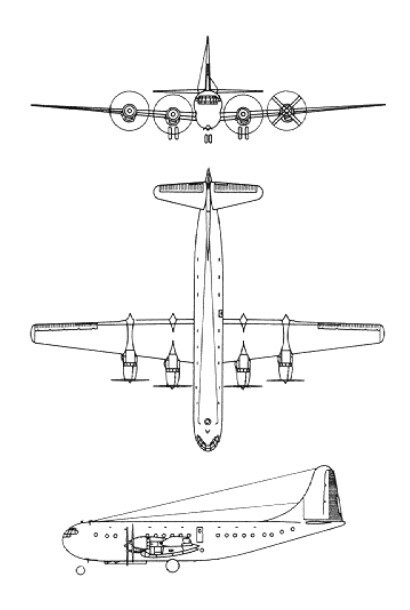 The 'double-bubble' section fuselage appears to be entirely new, but the lower 'bubble' was basically a B-29 structure, and so was the tail unit attached to the new (and larger) upper 'bubble'. On 6 July 1945, following brief evaluation of the prototypes, 10 service-test aircraft were ordered. These comprised six YC-97 cargo transports, three YC-97A troop carriers, and a single YC-97B with 80 airline-type seats in its main cabin. The first production contract, on 24 March 1947, for 27 C-97A aircraft with 2425kW Pratt & Whitney R-4360-27 engines, specified accommodation for 134 troops, or the ability to carry a 24,040kg payload. Two transport versions followed, under the designation C-97C and VC-97D, and following trials with three KC-97A aircraft equipped with additional tankage and a Boeing-developed flight-refuelling boom, KC-97E flight-refuelling tankers went into production in 1951. This version was powered by 2610kW R-4360-35C engines. The KC-97F differed only in having R-4360-59B engines. Both the KC-97E and KC-97F were convertible tanker/transports, but for full transport capability the flight-refuelling equipment had to be removed. The most numerous variant, with 592 built, was the KC-97G which had full tanker or full transport capability without any on-unit equipment change. Twenty KC-97s are assigned to each 45-plane wing of B-47 bombers. The KC-97G combines in one aircraft the duties of transport and " flying boom" tanker, its boom being a permanent fixture. Earlier versions had removable booms for conversion into transport role. The KC-97G usually carries two 1700-gal. fuel tanks under outer wings. When production ended in 1956 a total of 888 C-97s had been built, and many were converted later for other duties. The KC-97L variant had increased power by the installation of a 2359kg thrust General Electric J47-GE-23 turbojet beneath each wing to improve rendezvous compatibility with Boeing B-47s. KC-97Gs converted to all-cargo configuration were redesignated C-97G, and in all-passenger configuration became C-97K. Search and rescue conversions were HC-97G, and three KC-97Ls went to the Spanish air force, being designated TK-1 in that service. Several have served in many roles with Israel's air force. The Boeing Model 377 Stratocruiser was a commercial transport development of the Model 367 (military C-97), and based on the improved-structure YC-97A with Pratt & Whitney R-4360 engines. The first flight of the prototype Model 377-10-19 was made on 8 July 1947, and it was delivered subsequently to Pan American World Airways, which was the biggest user of the Stratocruiser. There were a variety of interior configurations in the Models 377-10-26, -28, -29, -30, -32 accommodating from 55 to 112 passengers or, if equipped as a 'sleeper', with 28 upper- and lower-berth units, plus five seats. The main cabin was in the upper lobe of the 'double-bubble' fuselage, with a luxury lounge or cocktail bar seating 14 on the lower deck, reached via a spiral staircase. Of the total of 55 that were built, Pan Am was operating 27 at one period. Of these, 10 were given additional fuel capacity to make them suitable for transatlantic operations, and were known as Super Stratocruisers. At a later date the entire fleet was equipped with General Electric CH-10 turbochargers, enabling each engine to develop an additional 37.3kW. British Overseas Airways Corporation also acquired a fleet of 17 with only six of these were original purchases from Boeing, the remainder acquired from other airlines. After just over nine years' service with BOAC, 10 were sold to Transocean Airlines in the USA during 1958. Of these, four were converted to 117-passenger high-density seating, the remainder each having an additional 12 seats added to their standard 63- and 84-seat layouts. Before Stratocruisers disappeared from service during 1963, a few had been modified to a cargo configuration, but by far the strangest conversion resulted from those airframes acquired by Aero Spacelines Inc. Under the designation 377-PG, this company built an oversize cargo aircraft which it named 'Pregnant Guppy' and subsequently built other examples, using both Model 367 and 377 airframes, under variations of the Guppy name. The YC-97J designation for two KC-97Gs converted for USAF use as flying test-beds, each with four 4250kW (5,700-shp) Pratt & Whitney YT43-P-5 turboprop engines. Capacity: 134 troops, or 24,040kg payload. Engines: 4 x Pratt & Whitney R4360-75, 3,500 h.p. Wingspab: 141 ft. 3 in. Max range: 4,200 miles at 300 m.p.h. at 25,000 ft.
First prototype. Improved-structure YC-97A with Pratt & Whitney R-4360 engines. Variety of interior configurations in the accommodating from 55 to 112 passengers or, if equipped as a 'sleeper', with 28 upper- and lower-berth units, plus five seats. Engines: 4 x Pratt & Whitney R-4360-B6 Wasp Major, 3500 hp, 2610kW. Prop: 4 blade 16 ft 7 in (5.05m). Wing span: 141 ft 3 in (43.05m). Length: 110 ft 4 in (33.63 m). Wing area: 1,769 sq ft (164.3sq.m). Weight empty 83,500 lb. (37,870 kg.). Max wt: 145,800 lb (66,134 kg). Typical cruising speed: 300 mph (483 km/h) at 25,000 ft (7,620 m). Max cruise speed: 340 m.p.h. (550 kph). Ceiling: 32,000 ft. (10,000 m.) fully loaded. Typical range: 2,750 miles (4,426 km) with max payload. Max range: 4 600 miles (7,400 km.). Cruise 50% pwr: 270 kts @ 25,000 ft / 135 USG/Hr/engine.